Many schools endeavour to provide effective, relevant and appealing alcohol education to students, using up-to-date technologies and resources. However, choosing an appropriate, evidence-based program or approach is rarely straightforward given the plethora of options and limited evidence base. The alcohol education literature and findings from a recent Australian study indicate four key features of effective alcohol education approaches � interactivity, peer education, exploration of students� opinions/knowledge, and addressing alcohol-related misperceptions. These four features are acknowledged strengths of audience response devices (�clickers�). Clickers are increasingly popular, supported by growing evidence of suitability for a variety of educational application and have untapped potential in the delivery of alcohol education. Clickers can engage and empower students and their ability to elucidate misperceptions regarding prevalence and acceptance of risky alcohol use among peers corresponds with normative education approaches. 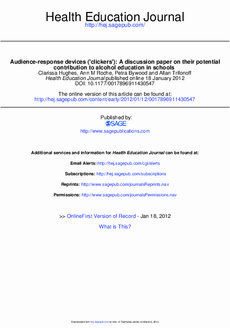 Clickers are effective, fun, create valuable �teachable moments� and provide potential to enhance delivery of evidence-based alcohol education.